The swearing-in of two new council members marked a new era for the City of Commerce, but talk of “change” and “moving forward” was not enough to convince some residents that more harmonious political times are ahead. 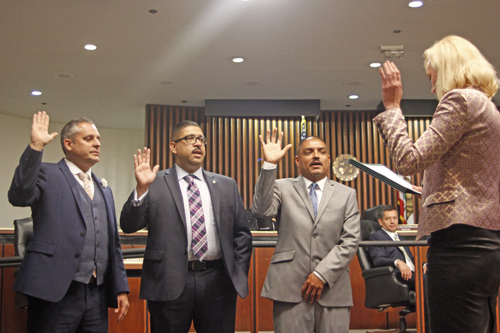 Leonard Mendoza, John Soria and incumbent Ivan Altamirano took the oath of office Tuesday during a crowded city council meeting. 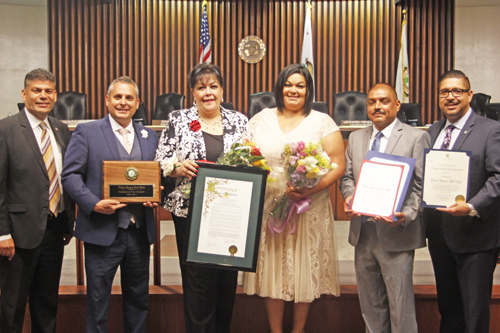 The three received the top votes in the June 6 election, each securing a four-year term while ousting longtime Councilwomen Lilia R. Leon and Tina Baca Del Rio. For years, the Commerce City Council has been divided with at least one member behind the dais on the outs. Recently, that lone wolf has been Councilmember Hugo Argumedo, who was the target of a failed campaign started by Soria to remove him from office. On Tuesday, the newly formed council appeared to pledge to make past political infighting a thing of the past now that Commerce residents have voted for change. “It was important to give residents a choice,” said Mendoza, referring to the 10 candidates on the ballot. “You wanted to give other people a chance,” he told the crowd. The nomination of Oralia Rebollo as mayor and Altamirano as mayor pro tem, however, left some in the audience feeling the council is likely to remain divided. Sandra Cornejo, a longtime resident and wife of a former Commerce councilman, told EGP that by ignoring rotating traditions and skipping over Argumedo who was next inline for one of the council’s top two positions, the new council showed they are still divided 4-1. Carmen Marquez has lived in the city for decades and says she has “seen it all” over the years, including councils that didn’t always get a long, but now hopes things will be different moving forward. “I would like to see things stay positive,” she told EGP Tuesday. “Focus on good decision making,” she advised the council. During the city’s final vote tally last week, longtime resident Javier Hernandez congratulated Soria on his win, then asked him to not “forget to work together” with his new colleagues. Hernandez, one of a dozen or so residents in attendance, told EGP he was content with the results. Altamirano doesn’t buy that characterization and told EGP residents didn’t give the incumbents a fair shake, arguing that many projects now in the works took years to execute. In the end, residents were “not seeing results and it was too little too late,” Altamirano said. For years, Baca Del Rio, who was first elected in 2005, was nicknamed “Teflon Tina,” a reputation forged from winning reelection after being recalled and surviving another recall attempt despite controversy over her Fair Political Practices Commission (FPPC) filings. Leon was first elected to the council in 1998 but did not seek reelection after her first term. Years later she again ran for office, winning reelected in 2008 and 2013. She too defeated a recall attempt in 2009. She is credited for founding the city’s annual college fair. On Tuesday, both women were recognized for their years of service to the city. Councilmembers and local dignitaries called the two “mentors” and credited them for their successful efforts spurring economic development in the city and for major street improvements. Leon, 68, said she was going to enjoy retirement but continue to stay involved in the community. “You need to be involved, not just during election time,” she advised residents. Argumedo chose to recall a more positive time in his often-bumpy relationship with Baca Del Rio, telling the story of why he first appointed her as one of his commissioners. A tearful Baca Del Rio thanked Argumedo for the appointment that catapulted her political career. “I wouldn’t be here now because I didn’t see that in myself [back then],” she told Argumedo. Baca Del Rio told EGP she was not surprised by her loss, admitting she hadn’t really campaigned, instead deciding to leave the outcome up to fate. She says she’s ready to dedicate more time to her family. With over 1,700 ballots submitted, City Clerk Lena Shumway said the election saw a 97 percent increase in participation. “There were more absentee ballots than votes at the polls,” she added. The final count was: Mendoza, 522; Soria, 508; Altamirano, 475; Tina Baca Del Rio, 450; Jaime Valencia, 440; Denise Robles, 423; Johncito “John” Peraza, 406; Lilia R. Leon, 390; Sylvia Muñoz, 345; and Charlie Calderon, 208. The newest council members thanked residents for their support and vowed to keep the city moving forward. “I made a lot of commitments, these commitments are going to keep me busy the next four years,” echoed Mendoza. Altamirano told EGP he was relieved, humbled and grateful for his victory. He received just 25 more votes than the next candidate, Baca del Rio. COMMERCE – Some familiar faces and novice candidates are challenging three City of Commerce council members up for reelection on June 6. Saying they hope to bring change to the city, last week four of nine council contenders went head to head with Mayor Ivan Altamirano, Mayor Pro Tem Tina Baca Del Rio and Councilwoman Lilia Leon, who have each had their share of controversy while in office. The face off took place during a candidate forum May 4 at City Hall hosted by the League of Women Voters. Much of the night’s discussion revolved around reducing crime and beautifying the city as a means to attract more business and generate more revenue for city services. While Commerce may not be strapped for cash like some of its neighbors, large lots along the city’s busiest corridor have remained vacant for years, curtailing economic development, according to candidates who accused the council of not doing enough to attract new business to the city. Drive a mile and you will see dozens of “for lease” signs, said challenger John Soria, a law enforcement technician and second-time candidate for city council. The city’s 1 percent vacancy rate can mostly be attributed to a single owner, one of Commerce’s founding families, responded Altamirano, who added he is meeting with the owners to discuss the issue. Former councilwoman and nonprofit advisory board member Denise Robles echoed the accusation, saying it’s apparent there “hasn’t been a whole lot of economic development” since she lost her reelection bid two years ago. Robles accused the incumbents of not focusing on city cleanliness, which she said is important when trying to attract business. “It has not been due to a lack of funds, but a lack of priorities,” Robles said. “This didn’t just happen in a handful of months, this took years” of working hand-in-hand with the business community to bring change, Baca Del Rio said, adding, “We didn’t have that relationship” before. This council has put Commerce on the map, said Leon, citing as an example a city-sponsored shuttle service to the Citadel Outlets that attracts 17 million visitors annually. When the city was strapped for cash, during the recession and following the loss of its redevelopment agency, it was she and her colleagues who kept the city afloat, said Leon, who has served several terms, though not consecutively, since 1998. “I brought in donations [from businesses] to make sure services were not taken away,” Leon told the audience. By thinking outside the box, this council kept a lot of people from being laid off, said Altamirano, who was appointed in 2012 and won re-election in 2013. Highly industrial, Commerce has long struggled to balance its need for revenue to pay for city services and the environmental impact businesses have on city residents. Pollution and contamination caused by industry, rail yards, and the never-ending flow of diesel trucks, has left many residents concerned about their health and quality of life. The city should defer to what residents want when it comes to new businesses moving to Commerce, said Robles, referring to a failed venture to bring a Walmart to the city that caused protests from residents. Other candidates said the city council should be making sure that existing businesses are complying with the city’s green zone initiative, and should be required to erect improved signage informing the public of any emissions or impacts to the environment. “I’m in favor of working with businesses that will create jobs and create a balance with environmental issues,” said Johncito “John” Peraza, a 20–year-old loan analyst and city commissioner. Soria said industry is not the only culprit when it comes to environmental issues, attacking incumbents for failing to expedite the lead clean up underway at Veterans Park, which has been closed to the public for months and may require a complete renovation. He stressed that parks are a deterrent to crime and provide a safe place for children to spend their free time. Each of the challengers said the council has not done enough to reduce crime and he or she would do a better job if elected. But according to Altamirano, public safety has been his top priority. He said he has been working to open a Los Angeles County Sheriff’s substation in the city, which he believes will help reduce the spike in crime by making law enforcement more visible. Lacking any real detail on the proposal, most of the candidates said they are reserving judgment until the substation project is officially presented to the city council on May 16. Soria called it “very premature” for individuals to “flaunt” the merits of such a proposal. Robles says it is more important to improve the city’s current patrol system before building a station. For Peraza, “restoring integrity and honesty in our government” is his top priority. He was referring to the controversies surrounding the incumbents, who in the past have each been targeted for recall and in the cases of Baca Del Rio and Altimarano’s, have also been fined by the Fair Political Practice Commission for ethics violations. Last year, Baca Del Rio, who has been on the council since 2005, was accused of 24 violations of the Political Reform Act and faced a $104,000 fine, one of the largest in state history before it was later reduced. The councilwoman was accused of illegally transferring campaign funds into her personal bank account to pay for personal expenses related to a kitchen remodel and failing to file contributions and campaign statements in a timely manner. Baca Del Rio denied she misappropriated campaign funds and claimed she paid herself back for campaign loans, something FPPC investigators said they found no evidence of. The FPPC ultimately reached an agreement with Baca Del Rio, who admitted to 12 of the charges and agreed to a reduced fine of $55,000. Less than two months later, Altamirano agreed to pay a $15,500 penalty for violating five counts of the Political Reform Act, when he failed to timely file and properly disclose financial activity on a pre-election campaign statement and for voting on a matter the FPPC concluded he had a financial interest in. He was accused of using his position to get his sister appointed to a city commission, which comes with a stipend. But it is not just the incumbents who have been the center of controversy in recent years: Former councilwoman Robles was also at one point targeted for recall and was accused of using a city-owned vehicle to commute to school, personal business which is not allowed. Soria unsuccessfully ran for office two years ago, but it is his failed campaign to oust Councilmember Hugo Argumedo from office that may ultimately wind up costing Commerce money if Argumedo were to prevail in a lawsuit against the city for its role in that effort. “I believe our government officials need to be held to the highest ethical standards and treat people with common courtesy and respect,” says Peraza in his campaign statement. Businessman Charles Calderon, former councilwoman Sylvia Muñoz, truck driver Randy “Sax” Romero, and Jaime Valencia, an accountant, are also on the ballot, but were not at the forum. COMMERCE – To eliminate the confusion that could result from voters having two different polling places and being given two different ballots in the March 2017 election, the Commerce City Council is considering changing its General Municipal Election to April or June. The council met Wednesday during a special meeting to discuss an emergency ordinance that would change the March 7, 2017 election to a later date, or consolidate the city’s election with a special county election on a proposed quarter-cent sales tax increase to fund housing for the homeless. 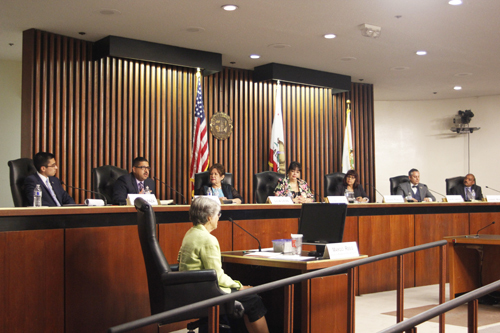 County supervisors hope that the 36 cities and special districts currently scheduled to hold elections on March 7 will consolidate into a single Special Election conducted by the County. Consolidation is not mandatory and cities can hold a stand-alone election if they so desire. Supervisor Mark Ridley Thomas says the benefits of a consolidated election are clear. “They improve voter clarity, avoid duplication of services, reduce voter fatigue, and serve to ensure a countywide awareness of the election which facilitates and encourages voter participation,” he wrote in a motion to hold the countywide election. While consolidation might be advantageous to the County, the benefits to Commerce are not as clear-cut. The city would lose control of the vote count, meaning residents would not have a clear idea who won on election night, explained City Clerk Lena Shumway during the Oct. 4 council meeting. It could take up to 6 weeks for the County to certify the election results, she pointed out. Commerce has the option to keep the same March 7 election date and not consolidate with the county, but that option presents other potential problems. Commerce residents could also be faced with having to vote at two different polling places– one for the County election and another for the General Municipal election. To avoid confusion, staff advised the Council to move the election to April 11. Another option would be to move it to June 5, however City Administrator Jorge Rifa recommended against it would take place in the midst of the budget process. Changing the date would be more costly for Commerce. City staff estimates an April or June election would cost $50,000 to $55,000, while consolidating with the County in March would cost be about $14,000, according to the Registrar-Recorder Office. Shumway pointed out that the County’s estimate could increase due to incidental expenses. Another option is to instead consolidate the March 7 election with the City of Los Angeles, which will be holding its Los Angeles Community College District Board of Trustees election. The cost would be split and the Commerce’s portion would be around $30,000. The council was adamant about keeping its election separate when the issue was brought to them on Oct. 4. “Can I just say I’m totally against this,” Baca Del Rio said in response to changing the date. Councilman Hugo Argumedo reminded his colleagues and staff that when elections were consolidated in the past the City lost control and election results were delayed. “We should maintain local control, we should hold our own election,” he said. Councilwoman Lilia Leon questioned whether it was wise to have an election where residents would have two separate ballots. Commerce holds city council elections in March during odd-numbered years. Mayor Ivan Altamirano, Mayor Pro Tem Tina Baca Del Rio and City Councilwoman Lilia R. Leon are up for reelection in 2017. The final tally of votes in the City of Commerce Monday did not change the outcome of the tight race for city council, with former councilman Hugo Argumedo remaining in first place and political newcomer Oralia Rebollo coming in second, beating out incumbent Denise Robles by 59 votes, to claim one of two seats up for election. Counting of the remaining provisional and vote-by-mail ballots Monday was repeatedly delayed by technical issues with the city’s voting machines, but in the end, Argumedo had received 599 votes, Rebollo 556 and the defeated Robles 497. Via email, Robles told EGP it has been a privilege serving the people of Commerce for the past four years. “Learning, growing, and establishing relationships was all part of the experience that I will carry with me as I continue,” said the one-term councilwoman who was first elected in 2011. 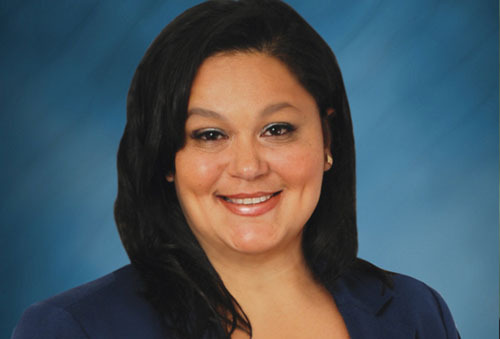 Oralia Rebollo was elected as one of the newest Commerce councilmember. Argumedo’s past troubles did not seem to weigh heavy in the minds of voters—he was barred from holding office for three years after pleading guilty to signing a false statement during a civil lawsuit involving the city. Argumedo campaigned on his past record on the council and his part in bringing improvements and revenue generating developments to the city while in office. Argumedo told EGP he is humbled and honored by the overwhelming support from the community. “I want to make sure that we move our city forward, and for me, it is important not to leave the residents behind,” he said after the final vote total was announced at City Hall. He said his priorities are to restore some of the programs that have been eliminated and to pay closer attention to the needs of seniors. Hugo Argumedo, a former Commerce city councilmember, was elected to represent the city once again in this month’s election. Rebollo was endorsed by Mayor Tina Baca Del Rio and Councilmen Ivan Altamirano and Joe Aguilar. Together with Councilwoman Leila Leon they often composed the majority in 4-1 decisions, with Robles casting the lone dissenting vote on issues before the council. Whether the loner distinction will be passed on to Argumedo remains to be seen. During the campaign he said he was hoping to work with Robles, but on Monday said he is willing to work with all the members on the council. “The voters have spoken and we have to respect them, they are the ones who decide who will represent them,” he said. Longtime Commerce resident Javier Hernandez was among the small group of people watching the ballot counting in person Monday afternoon: The count was also televised on the Commerce City Channel 3. Speaking in Spanish, he told EGP he has high expectations from the new council members. “Now I’m relying a lot on the new councilman, Argumedo, because [the current] council members are not doing their job properly,” he said, referring to their raising of their salaries and higher fees for activities, which the council reversed days before the election. Change can be scary, so can the unknown. Election results have yet to be officially certified in Monterey Park or the City of Commerce, but it appears voters in those cities have for the most part opted to stick with what’s familiar. In Commerce, voters turned out the only incumbent in the City Council race, electing a newcomer backed by current members of the Council and electing a former council member to fill the two seats up for grabs. But Commerce candidates cannot celebrate just yet, provisional ballots may be the deciding factor in this very close race. A final count on Monday could change precinct results. In Monterey Park two incumbents Mitchell Ing and Teresa Real Sebastian were re-elected to office however voters chose to not re-elect the third incumbent running for office Anthony Wong and instead voted in a new candidate Stephen Lam. On Wednesday, former councilman Hugo Argumedo was leading the vote count with 510 votes, 11 votes ahead of educator and city worker Oralia Rebollo’s 499 votes. Incumbent Denise Robles was in third place with 440 votes. But that could all change next Monday when the City Clerk will finish tallying the results from still uncounted ballots. There are enough outstanding votes to change the results of the election, according to Commerce City Clerk Lena Shumway, who told EGP that there are at least 163 more provisional ballots that will not be counted until Monday after all timely postmarked mail-in ballots are received. The final count will take place at City Hall at 2pm, she said. Argumedo was first elected to the council in 1996 to fill an unexpired term and reelected in 1999, 2003 and 2007. He resigned and was barred from holding public office for three years in 2010 after pleading guilty to signing a false statement in a civil lawsuit. He told voters he made a big mistake signing the document, and asked them to remember all the good work accomplished while he was on the council, from the Commerce Casino hotel and Citadel Outlet expansion, hotel occupancy tax and other city improvements. Rebollo has the backing of current members of the council, and has said she is very interested in the city developing policies to assist special needs individuals and families in the city. Robles was often at odds with her fellow council members, most recently voting against a 35% retroactive pay hike for council members. The final two will serve for four years, until 2019. According to the City Clerk’s Office, 1,313 of Commerce’s 6,429 registered voters – 20.4 % – cast a ballot. Planning Commissioner John Diaz, Rebollo’s running mate, received 360 votes; Sonia Rodriguez and John Soria received 257 and 247 votes respectively. Monterey Park voters did not let a potential history-making decision influence who they voted for Tuesday. Speculation was that the city could be on the verge of electing its first all-male and all-Chinese council in history. Instead, they voted to return two of the three incumbents for another term. Mitchell Ing and Teresa Real Sebastian won their reelection garnering 25.5 and 23.7 percent of the votes respectively, according to unofficial results. Voters however wanted to see some change, and voted to deny Councilman Anthony Wong a third term, giving the third seat up for a vote to businessman Stephen Lam, who received 21 percent of the votes cast. Wong came in fourth place with 19.6 percent of the votes. Had incumbent Teresa Real Sebastian been defeated, it would have been the first time in decades no women would be on the Council. If Wong had been elected instead of Real Sebastian, Monterey Park would have become the first city in the country with an all Chinese City Council. Monterey Park’s population is 67% Asian, with Latinos coming in second with 27%. Real Sebastian is the only Latina on the five-member council. Big money was spent on the election campaigns, but the results seem to have defied the notion that large campaign contributions and a long list of endorsements always translate to election wins. Wong raised nearly $110,000 and received big name endorsements from Congresswoman Judy Chu, California State Treasurer John Chiang and Sen. Ed Hernandez, but still lost. Ing, who raised less than $8,000, was the frontrunner Tuesday. Delario Robinson, a postal clerk and Joe Avia, a handyman received 5.4 and 4.8 percent of votes respectively. According to the City Clerk’s Office, 4,588 of the 27,474 or 16.6 percent of registered voters in the city had voted. The elected officials will serve until their term ends in 2019. Ing and Real Sebastian will not be able to seek reelection due to a city ordinance passed in 2013 that prohibits city council members from serving two consecutive terms. Candidates for the City Council have made the cost of Commerce’s popular Resident Activity Card a big issue in the March 3 election, claiming a 3-tier fee system imposed five years ago during the economic downturn is hurting low-income residents and seniors, and should have been rolled back some time ago. The issue has made it on to campaign mailers and at a recent candidate’s debate, several candidates vying for two council seats, criticized the council for not cutting the fees given the city’s improved financial outlook. Last week, the Commerce City Council did just that, unanimously approving a motion by Mayor Tina Baca del Rio to eliminate the multi-level pricing schedule in favor of an across the board $5 processing fee for all residents, with the exception of seniors 70 and older who will receive the lifetime card for free. The council also voted to eliminate registration fees for a majority of the city’s recreation programs. The city’s activity card allows residents to take part in a variety of activities for free that many other cities charge for, such as aerobic and aquatic exercise classes, sports programs, dance, arts & crafts classes and preschool programs. Dealing with the financial fallout of the “Great Recession” and a $3 million revenue shortfall, the council voted in September 2010 to increase the fees, and in June 2011 to establish the controversial 3-tier system as it tried to manage the then nearly $4 million deficit in the wake of the State’s taking away of the city’s redevelopment funds. But the city’s finances have improved, with a $1 million dollar surplus for the 2013-2014 Fiscal Year, in large part due to increased revenue from Measure AA, a 2012 voter approved half cent sales tax increase. City Council candidate John Soria has made the fees the linchpin of his campaign and told EGP he’s glad the others candidates have also seen the “value” of reducing the fees and have made it their cause. “Our residents deserve to have affordable access to city programs and services available as a result of healthy revenue generated by our industrial neighbors,” he said. Candidate and former councilman Hugo Argumedo told EGP he does not understand why it’s taken the council so long to act on reducing the fees for programs that the city’s low-income residents depend on. “Why did it take an election for them to act,” he said. “They had no problem raising their salaries,” referring to a 35% increase approved earlier this year. By law, the city council can raise their salaries 5% a year, but due to the financial crisis, they had not hiked their pay in seven years. The 35% increase covers the full seven years and will go into effect in April. Only Councilwoman Denise Robles, who is up for reelection, opposed the increase. The council always said it would rollback fees once the city’s financial condition improved and they believe it has, Parks and Recreation Director Scott Wasserman told EGP. In a letter mailed out last Thursday and Friday to about 3,300 Commerce households, City Administrator Jorge J. Rifa wrote that Commerce’s improving financial condition had allowed the council to reduce the Resident Activity Card to $5 and reduce fees on other popular programs. Other programs, such as kids club, youth and adult swim lessons, camp Commerce, adult golf program, admission to the adult holiday faire and adult arts and crafts will continue charging, as they have always done. Former councilwoman Sylvia Munoz said she’s glad the fees have been reduced, “but residents deserve more.” She said since Commerce was first founded it always operated under the motto of “the city for the people” and resident cards were free. Now, she questions whether the fee reduction is permanent or if they will go up again after the elections. The fee reduction will reduce city revenue by $65,000, Wasserman told the council at its Feb. 17 meeting. He said all but $13,000 of the revenue was generated through the $10 regular card, the cheapest in the 3-tier schedule. The approval of Measure AA coupled with businesses doing better has put the city in a better place to keep programs strong, Councilman Ivan Altamirano told EGP. “It is a great thing to be able to hear what our community needs are and be able to provide [it],” he said. Munoz told EGP the three-tier card was hurting mainly families with three or more children because activities were becoming expensive. “Hopefully now [with the change] they can enroll kids in more sports,” she said. The city will refund fees to residents who paid the higher fees after Jan. 1 of this year. People who paid with a credit card will have the money returned to the card they used. Those who paid by cash or check should go to the parks and recreation counter to request a refund between March 1 and April 1, 2015. On March 3, voters in several local cities will go to the polls to elect members of their city council and local school boards. The past several elections have seen historically low voter turnouts, with in some cases fewer than a quarter of the eligible voters deciding who will lead us through these complicated times, and how to spend our tax dollars. In cities across the region, what development, housing and city services should look like are ongoing concerns. While the economy has improved, the plight of many low- and middle-income families has lagged behind. In every city there is talk about encouraging businesses to locate there and ways to create more jobs. Education is still seen as the best way to improve one’s chances for a better life and financial security, yet there are diverse views on what’s needed in our schools to help students achieve. The people elected next Tuesday will have a big say in that happens in all these areas. EGP encourages voters to have a say in their future, and to get out and vote March 3. We endorse Dr. Ref Rodriguez in this race. We feel that the incumbent Bennet Kayser has had an opportunity to assist the LAUSD in reforming many issues of concern to parents and students of the school district, but seems to just continue in the role of supporting the status quo. We have not been impressed by his performance and feel that he failed to act as an independent or inquisitive advocate for the diverse mix of students in his District. From questions regarding the iPad fiasco, to the debacle at Jefferson High with LAUSD’s student (mis)information system, a technological disaster, it seems to us that he has failed to demonstrate the leadership needed to correct these problems. It’s time the District is represented by a more thoughtful and resourceful representative. Ref Rodriguez to us is just such a candidate. Rodriguez grew up in Cypress Park and has a good understanding of the challenges students, faculty and parents in the District’s lower-income, predominantly Latino schools face. As one of the co-founders of the charter schools under Partnerships to Uplift Communities, he has a comprehensive understanding of what it takes to create schools that work, from developing curriculum to supporting teachers to engaging families and the surrounding community. While it’s easy to lump people in to pro- or anti-charter school groups, we were impressed by Rodriguez’s commitment to make all schools work, and willingness to decertify charters that fail to meet education goals and standards. He supports ensuring teachers have the tools they need to succeed, including being fairly compensated and involved in the decision process as a team member. But he also understands that teachers do not have an exclusive on good ideas and what works. We like that Rodriguez has more questions than answers, and promises to use his questions to break through the entrenched bureaucracy which often stands in the way of progress. We believe he is uniquely qualified to be on the school board to represent the district’s diverse students and parents. Among Ref’s many contributions to the area in education is his appointment to the California Commission on Teacher Credentialing by Gov. Jerry Brown and Board member of Alliance for a Better Community Los Angeles. He has served as a board member of Glassell Park Neighborhood Council, board member of Los Angeles Boys and Girls Club, Los Angeles and a member of Small Business Alliance. Rodriguez’s education consists of Doctor of Education Fielding Graduate University and Bachelors of Arts and humanities, Loyola Marymount University. Vote for Ref Rodriguez for LAUSD District 5. We recommend a No Vote on both measures to amend the city charter to change the elections dates for city offices and ballot propositions. While we agree that something must be done to increase voter participation in city elections, changing the sequence of elections and terms of office are not the solution to the problem of voter apathy. Changing city elections to coincide with the Presidential Election does not guarantee that voters will be any better informed or enthusiastic about city elections. In fact, there is a real danger that the information about city offices and ballot measures will be drowned out by the louder and better-financed state and national campaigns. Not to mention that the change would result keeping some elected officials in office nearly two years longer than voters might want. It’s an experiment that the city doesn’t need at this time. What city voters would probably prefer is a way to make voter eligibility and voting less difficult. We believe many potential voters would come out to the polls if they could register the same day to vote by provisional ballot and if there were less complicated ways to vote once registered. While there is something to be said about the smooth working of a city council not embroiled in political one-upmanship, it is equally important to have city councils with members who are willing to stand alone when they don’t agree with their fellow council members. That is why we endorse Denise Robles for reelection and Hugo Argumedo for the second open seat. 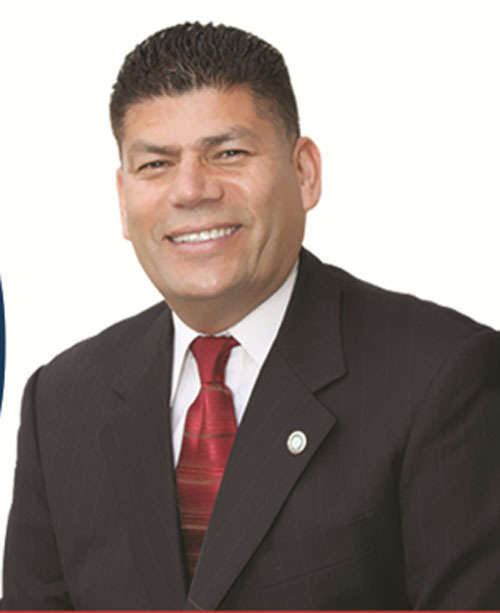 Hugo Argumedo has been on the council before, elected in 1997, 1999, 2003 and 2007. During the time he served Commerce experienced an era of growth in many areas, from new retail developments to improvements in the city’s infrastructure and services. The Crown Plaza Hotel was inaugurated and the Citadel was expanded, which led to the creation of many jobs for the area. He helped negotiate a new contract with the fire department, saving the city millions of dollars. He helped pass a hotel visitor tax, which now generates approximately $2.3 million for the city. We are well aware that his tenure was not without controversy, but we believe he has learned valuable lessons from his mistakes that are likely to help him push for greater transparency if elected. We support Denise Robles because she has not been afraid to be the lone voice of opposition on issues before the council. She has refused to be bulldozered, when it may have been personally more practical and advantageous to just get along. That’s not to say that we always agree with her; in fact, there have been times when we thought she was on the wrong side of an issue. But we believe that Robles has conducted herself in a professional manner and represents voices in the city not always heard. Like her fellow council members, she has her own constituency and followers and that’s okay. One person speaking out alone is often seen as an interloper, and while they may have valid points of views and concerns, they are often written off as a troublemaker. EGP believes the reelection of Robles and election of Argumedo will add balance to the equation, although it is our hope the council will avoid splits on issues that are more about power and control than differences over the best path to serve Commerce residents and businesses. Vote for Robledo and Argumedo for City Council.